This easy to use sunless tanning airbrush system gives you a fast healthy looking, natural looking tan that will have people talking about it. This easy to use tan will last for a week or more! No need to go out and get those nasty sunburns, instead easily spray this sunless tan on with the co2 cartridges that are provided and spray on a perfect tan. You will get a very nice mist that will evenly spray the tan without leaving any streaks. The spray tan will help you apply a tan in just minutes and it is quick drying. Airbrush system emits fine, quick-drying spray for a perfect tan that lasts up to one week. Easy-to-use home airbrush system for a fast healthy, natural-looking tan. WARNING Intended for external use only. Avoid with eyes. keep out of reach of children. Not for personal consumption. The airbrush appliance is not a toy. Intended for use by adults only or under adult supervision. This product does not contain a sunscreen and does not protect against sunburn. Repeated exposure of unprotected skin to sunlight while tanning may increase the risk of skin aging, abnormal cell growth of the skin, and other harmful effects to the skin even if you do not burn. Water (Aqua), Dihydroxyacetone, Propylene Glycol, Dipropylene Glycol, Dimethyl Isosorbide, Ethoxydiglycol, Erythrulse, PEG-120 Methyl Glucolse Trioleate, Galactorabinan, Glycerin, Juglans Regia (Walnut)Shell Extract, Octoxynol-9, Retinyl Palmitate (Liposome Encapsulated Vitamin A), Ascorbic Acid (Liposeome Encapsulated Vitamin C), Tocopherol (Liposome Encapsulated Vitamin E), Sodium PCA, Betaine, Sorbitol, Glycine, Alanine, Proline, Serine, Threonine, Arginine, Polysorbate 20, Phenoxethanol, Methylparaben, Ethylparaben, Butylparaben, Propylparaben, Isobutylparaben, Caramel, Xanthan Gum, Citric Acid, (FD&C) Yellow 5 (CI 19140), (FD&C) Blue 1 (CI 42090), (FD&C) Red 4 (CI 14700), Fragrance. The airbrush system makes it so much easier to put on an even coat of tan. I really like this product and would recommend it to anyone who doesn't want to be wasting so much money on the tanning salons. Mayra "Just like a professional tan"
I have been to tanning salong where they personally spray you and I do have to say. The results from this system and that of the salon are just the same. This is much cheaper and just as effective. I love using this! 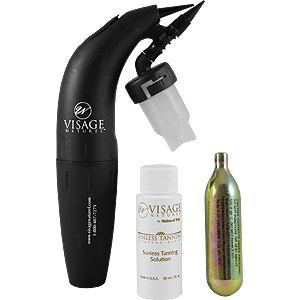 I have tried other airbrush systems but this one is one of the best ones. Works great with the co2 tanks that come with it to give you an even coating of tan. 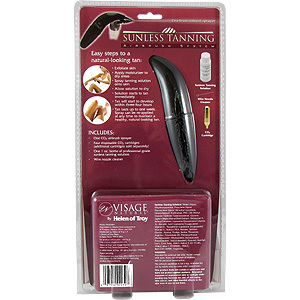 Sunless Tanning Airbrush System is shipped in a discrete, unmarked package. Orders are processed immediately and usually take about 3 to 5 working days to be received. We do ask that you try it for 2 to 3 weeks to feel the full effects. Any information received is used only for order processing and shipping purposes. Your information, such as e-mail address, will never be disclosed to a third party.